Beautifully engraved Certificate from the Excite@Home Corporation . This historic document was printed by the Security Columbian Banknote Company and has an ornate border around it with a vignette of the company's logo. This item has the printed signatures of the company's officers including George Bell as CEO and Chairman. On April 23, 2001 George Bell announced his resignation from the company after five years of service, first as president and CEO of Excite, Inc. and after the merger between @Home Network and Excite, as chairman and CEO of Excite@Home. 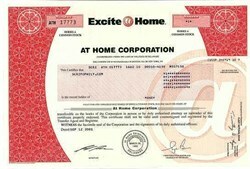 According to a Press Release dated 6/5/02, there is a lawsuit that alleges the company , Merrill Lynch & Co., Inc., and its former Internet stock analyst and First Vice President, Henry Blodget, violated the federal securities laws by issuing analyst reports regarding Excite@Home that recommended the purchase of Excite@Home and which set price targets for Excite@Home common stock which were materially false and misleading and lacked any reasonable factual basis. The complaint further alleges that, when issuing their Excite@Home analyst reports, the defendants failed to disclose significant, material conflicts of interest, which resulted from their use of Blodget's reputation and his ability to issue favorable analyst reports, in which they recommended the purchase of Excite@Home stock. The complaint also alleges that defendants failed to disclose material, non-public, adverse information which they possessed about Excite@Home. Throughout the Class Period, the defendants maintained an 'ACCUMULATE/BUY' or 'ACCUMULATE/ACCUMULATE' recommendation on Excite@Home in order to obtain and support lucrative financial deals for Merrill Lynch. As a result of defendants' false and misleading analyst reports, Excite@Home's common stock traded at artificially inflated levels during the Class Period. PALO ALTO, Calif., Sept 28 ExciteAtHome Corp. filed for Chapter 11 bankruptcy protection and that it's selling its broadband Internet access business assets to AT&T for $307 million in cash. The sale of the assets is subject to "the emergence of higher offers and closing conditions," the company release said. Excite said filing for Chapter 11 will allow it to keep its high-speed cable Internet access operating. "This filing is a tool to protect the value of the broadband business for the benefit of the company's financial stakeholders and will help reassure our customers that service will continue uninterrupted through the restructuring process," said Patti Hart, chairman and CEO, in a statement. Excite said it has sufficient cash on hand to finance its operations while the bankruptcy court reviews the proposed asset sale. The company also said it has retained an investment bank to help it pursue strategic alternatives and to assist with the bidding process. ExciteAtHome has long struggled to hold onto the Internet access business and dump its poorly performing media businesses, which provide content for the Excite.com Internet portal and have been bleeding cash recently. But after several months of trying, it has been unable to find a buyer for most of the content assets. REDWOOD CITY, CALIFORNIA, U.S.A., 2001 SEP 25 High-speed Internet access provider ExciteAtHome [NASDAQ:ATHM] today said it will close MatchLogic, its interactive marketing services subsidiary. The shutdown of MatchLogic, located in Westminster, Colo., is expected to be complete by the end of the year, the company said. ExciteAtHome said it would lay off approximately 500 workers over the next three months in a further effort to "reduce the company's focus on online media and narrowband business." In addition, the company said it would make unspecified changes to its Excite.com portal in an effort to attract more users. "Selling and reducing our narrowband media assets that do not contribute financially or strategically to the broadband access business is the right direction for our corporate viability," Patti Hart, ExciteAtHome's chairman and CEO said in a prepared statement. Today's moves continue what has been a tumultuous year for the once high-flying company. In July, while reporting second-quarter earnings, ExciteAtHome officials warned the cash-strapped company needed to raise money by the end of the year in order to survive. The company blamed its troubles on continued softness in the media and advertising markets. Including all non-operating costs, ExciteAtHome lost $346.3 million, or 85 cents per share, in the second quarter of this year - a three-month period ending June 30. Company officials said the loss was an improvement over the loss of $668.3 million, or $1.69 per share, in the second quarter a year ago, but indicated that ExciteAtHome is looking to change some aspects of its business. On Aug. 20, in a 10-K filing with the Securities and Exchange Commission, the company warned investors that it had a severe cash shortage and might not be able to survive the year. ExciteAtHome said there was "substantial doubt about the company's ability to continue as a growing concern." On Sept. 13, ExciteAtHome sold BlueMountain.com, its electronic greeting card subsidiary, to American Greetings Corp. [NYSE:AM] for $35 million in cash. ExciteAtHome previously had three rounds of layoffs this year and closed its media operations in France, Germany and Spain to focus on its core broadband operations.